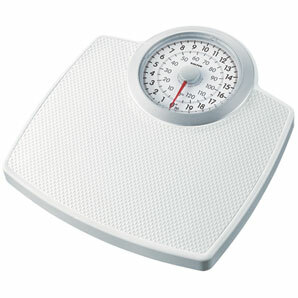 I stepped on the scale this morning and saw that I am currently at the lowest weight I’ve been in six years. Six years! It was monumental, I did a little dance. The only time I was much below this was the month my parents spent in Australia. I was on a strict diet of teddy grahams and cookie dough. I dropped ten pounds that month, it was great. And then, of course, I gained it back in a few months time. What a glorious way to start the day, right? Well, it also happens to be my good friend Stephanie’s last day in the office. This means a “quitter’s buffet”. In my office, it is typically the duty of the person leaving to bring in a baked good. Well today, I chose to celebrate my wonderful friend and brought in delicious chocolate mouse cake. Another friend made his famous homemade fudge. Stephanie brought in Krispy Kreme donuts. And her unpleasantly evil kind boss brought a few dozen donuts from another bakery. I have yet to consume any of this overabundant sugar fest, but it is getting quite tough to refrain. On my desk sits a small piece of cake and a small piece of fudge. It is staring at me. Thank goodness self control is stopping me from even considering the donuts. We’ll see how long I can hold off on the cake and fudge. Wish me luck. What about you: What sweet or salty treat makes your resolution waiver? How do you say “heck no” to delicious treats that are within arm’s reach? How many times have you said, “I’d kill for…”? 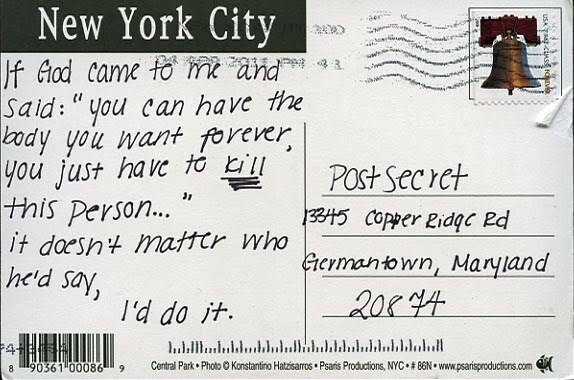 I came across this postcard from PostSecret this week and it struck a chord. I find myself agreeing with this individual, what wouldn’t I give to have the perfect body I’ve always wanted. I’ve tried to eat differently, increase my exercise, think more positively, but nothing has managed to work as of yet. Fortunately (or maybe unfortunately?) I will never have to face a decision as drastic as the one denoted in the postcard. There is still hope for my body the natural way, seeing as that is my only real option (no more plastic surgery for me). Here is to trying to be more positive! Tell me: What are your small victories of the day?